The relationship between miles per hour (MPH) and revolutions per minute (RPM) is useful for learning how to pace when cycling. Many stationary bikes and outdoor bikes have technology that provides metrics. However, you may find it necessary and helpful to manually convert between MPH and RPM readings. By determining your bike's unique conversion factor, you will be able to move between MPH and RPM with one-step arithmetic. Measure the radius of the wheel that receives power from the pedals. Radius is measured from the center of the wheel to its outside edge. Multiply the radius of the wheel by 6.28 to calculate the circumference of the wheel. This is the distance your bike covers in one revolution. Divide 1056 by the circumference of the wheel. The quotient is your bike's conversion factor for moving directly between MPH and RPM. 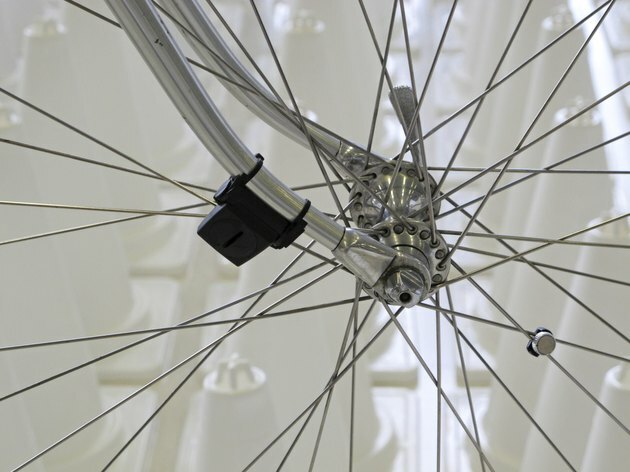 To calculate pedal RPM you must know your bike's gear ratios. How Do I Calculate the Cost of a Used Bicycle?